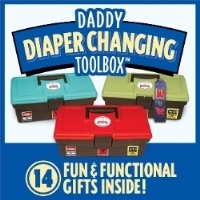 The Daddy Diaper Changing Toolbox by Funstuff4babies.com. This state of the art gift set is chock full of useful and humorous Dad to be gifts that combine functionality and fun! Put all other gifts for new dads to shame with this packed kit from staples such as baby wipes to the hilarious protective poop poncho! Our toolbox has everything a New Dad or Father to be needs to survive! Take the Daddy Diaper Changing Toolbox to the baby shower instead of (or in addition to) traditional baby gifts, Dad needs help too! The Daddy Diaper Changing Toolbox – the box that changed it all…As Seen on NBC Today Show with Bobbie Thomas Father’s Day gifts! The Father to be gift he won’t forget!! Mask – toxic fume filter for when it doesn’t smell like roses. Goggles – for protection against your own mini version of Old Faithful. Protective Poop Poncho – need we say more??? Tongs – Several inches of steel separation between you and the little warm wrapped gift. Turkey Baster – for precision hiney washing. Ear/Nose Plugs – use with care. Baby Wipes – for cleaning baby bottom and various parts. Diaper for Newborn – cute as a kitten until it gets wet then it looks and smells like a sewer rat. Bio Hazard Bag and Rubber Gloves – for quarantine containment of the nuclear meltdown. Emergency Formula Container – doubles as a PeePee cover for WeWe. Hand Wipes – to clean up afterward. (For Dad’s use only). Picture Frame – this is your badge of honor. “Win five sets of the Daddy Diaper Changing Toolbox”. Last date for entries is June 19, 2011.